Class objective: To continue the theme of Poetic tone by using examples from film and the poetry of William Blake. The following class can be tailored to fit a high school language arts course or a college Introduction to Literature, or British Literature section. 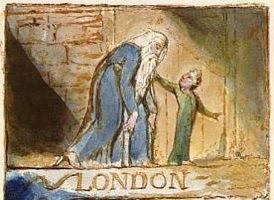 The class should have read at home, or in a previous class, William Blake's "Jerusalem" and "London,"
Having read selections from William Blake’s poetry, choose one of the poems you read to write about today. Try to imagine yourself in the first person in the poem. What colors are present? What sounds do you hear? How can you imagine yourself in the person (or persons) of the poem? 1. What colors does Blake evoke in his poetry? 2. Does Blake make it possible to imagine the scene, or the place of the poem? 3. What passages from the poems struck you the most? Why? 4. If Blake's poetry were shot as a film, what would his city look like? Jerusalem? London? After students have discussed the questions, introduce the terms, tone and voice. Explain to students that poetic tone is the mood, or the emotion the poet attempts to create in a poem. What mood is Blake trying to set? Explain: in film editing terminology, when an editor may want to set up a scene with what is called an establishing shot. This scene usually sets up the remainder of the scene by using a landmark or an external image to indicate where the scene will take place; it sets the tone. For example, in a sitcom, an establishing shot might be an exterior of the house. The next shot would be the interior of the same house. The idea is that the tone is set by establishing the exterior of the life of the characters by depicting the outside facade, and then followed by an interior shot. Usually establishing shots are used for practical purposes; for example, you need to know that the movie takes place in New York City so the film editor makes sure there is an establishing shot depicting the Chrysler building or the Brooklyn Bridge. But an establishing shot can also set the tone for a film or television show. You may not realize it but a film is often precisely crafted to elicit a certain emotion from the viewer. Often, this is created subtly in the film’s use of lighting, the photography used, the angle of the shots, the length of shots, how the film is edited, etc. Take, again the example of New York City. How many films do you know that take place in New York City? Show students two or three pre-selected scenes from films that take place in New York City (you can choose any city, really, but I chose New York City as an example). When showing the film clips, stop the video when appropriate to point out how lighting effects the mood. For example, look at Superman and how it depicts Metropolis as bright and productive as distinct from Batman which depicts Gotham as dark and dangerous. Explain: Blake considered himself a mystic. He said that when he was a child he saw angels in the tree in his backyard. This is important biographical information because it shows us that Blake considered himself a prophetic poet, according to Northrope Frye, throughout his writing career; Blake’s poems are consistently a mixture of narrative verse and prophetic verseHe was also a fierce individualist. He published his own works. His father was a print maker so he learned the trade of printing early on. His poetry is best understood in the context of his printing. The tone of the poems by Blake are interesting because they use elements of both design and text. Notice how the Norton Critical edtion titles Blake’s works, Blake’s poetry and desgins. NB: It would be a great moment to have books available for students to look at Blake's prints, or display images of several prints on an overhead projector or smart board. In this part of the lesson, the teacher is free to interpret the poetry any way he or she feels fit, or appropriate for the class. A good idea would be to highlight the most evocative lines that illustrate tonal voice, especially how the poems differ in their evocation of a city. Optional (for deeper enrichment): Read and discuss Camille's Paglia's criticism of Blake from her book, Break, Blow, Burn.